I know it is a cliche but time seriously does fly. When someone asked me if I could put together an Amsterdam packing list for 10 days in the late spring I thought, “I’m pretty sure that I just did one.” But it was almost exactly a year ago even though it feels much more recent. 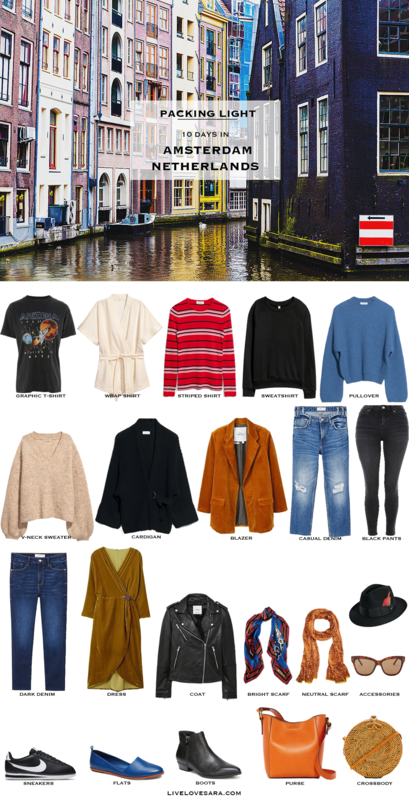 So today is a new and updated pairing of clothes for some ideas of what you could pack for Amsterdam, Netherlands. I must admit that I am totally in love with this one. The colours and textures in these pieces are so vibrant and rich looking and I want to duplicate every single piece in my wardrobe. I think I am starting to want more colour in my wardrobe because everything I find that I am drawn to recently is colour (which is a far call from my regular black). How about that corduroy blazer? Amazing isn’t it? Almost equal to the yellow velvet wrap dress. I am seriously going to do some wardrobe reflection after this. Amsterdam in the late spring (the trip is for May) is still cool but not cold, around 17°C as a daily high with lower temperatures at night. It can also cram a lot of seasons in to one day so bringing a light jacket and sweaters should be enough to stay comfortable through any fluctuations. I had this jacket in the running (see? more colour), but I went with a trusty leather jacket because who am I kidding? That would be the one that I brought with me. It’s my go-to. Also it would be a good idea to bring an umbrella, or you can pick one up for cheap when you arrive. Amsterdam is pretty casual in style so jeans, sweaters, and sneakers/flats/boots are a good choice to blend in with the local’s. You will also encounter cobblestone streets at different points so a comfortable walking shoe is important to include. When selecting your travel wardrobe it is important to have a common theme, something that ties all the pieces together so everything can mix and match well. As you can see from my selections, I have included a cognac brown colour that shows up in accents in many of the pieces and matches well with the pieces that it’s not in. It’s an important part in making sure that you can get the most options out of your pieces. Speaking of options I have put together 20 outfits from this list that can be found in this post. Have you had any new wardrobe epiphanies lately? Oh man, that Arizona t-shirt is amazing. And I was born in ’82, I kind of have to get it, right? I’m tempted to send in my own packing request as I’ve got an unexpectedly large bonus coming up and it looks like I might finally get to go on a vacation. Umm. Yes. Most definitely. I think it’s meant to be 😉 If I can ever find something with 1979 on it I will be all over it. And I’m all ears if you want to make a request. Just send me an email when you are ready.